"I wouldn't touch that thing even with a stick. I've said before to the manger that if we are selling anything that looks a bit like cockroach I'll leave and that thing is very close to crossing that line! You have to catch it yourself". So ended a brief conversation between Mika Kaukonen, this month's guest CotM author, and a pet store's salesperson. That particular verbal sentiment and the unforgettable expression as it was issued on her face has stuck with Mika to this day. In this case "the thing" was Gymnallabes typus, an eel catfish of the family Clariidae and I'll let Mika tell you the rest. Clariids are well spread over continents only absent from Europe, South America, Central America and Australia. There are estimated 15 genera and three unspecified genera that contain 93 valid species and around 25 new yet-to-be-described species. They are mostly appreciated and bred for food purposes. Some species are known well in aquarium trade as well. The most infamous and readily available (if you live in a part of the word where its import is not restricted) is Clarias batrachus in all its colour varieties. All others from this family are usually contaminants or very special imports. Gymnallabes typus is much more uncommon than its close relative Channallabes apus which is offered at least from time to time in the trade. They both look very much alike but have differences easily recognizable to a hobbyist who knows where to look. They both have very eel-like long bodies. Channallabes apus (30cm SL) grows much bigger than Gymnallabes (23cm SL). In Channallabes apus, pectoral and ventral fins are absent but not in G. typus. In Channallabes the head is not longitudinally grooved in comparison to the head of Gymnallabes which is somewhat globular in shape. In common vernacular Gymnallabes is one hell of an uglier SOAB than C. apus. At the time of writing, Gymnallabes contains three valid species; G. typus, G. nops and G. alvarezi. The latter two have, to my knowledge, never purposely been imported into the aquarium trade. I instantly knew that this catfish was a welcome rarity in these parts. It probably arrived as a contaminant in an African shipment. To me, as a catfish enthusiast, it was like winning the lottery. They sold it to me at ridiculously cheap price. On the other hand you can count with the fingers of one hand the people that would visit a regular store and are willing to pay much for such a fish. I understand why this catfish brings out contrasting emotions in people. It looks a bit like big night crawler or a slimy snake. It is not massive catfish. The tubular girth of its body is something like a man's little finger. So it could be housed in quite small aquariums too. It moves with an unnerving flexible grace. Mine has lived in aquariums ranging from 63 litres to 720 litres without any problems. In some literature it is said that it needs company of its own or can rapidly perish. I couldn't get other specimens but that didn't seem to affect to its well being. I suggest that if you have a chance to buy more of these then do that. They seem to be social animals. One aquarist has been able to get females to be gravid but no eggs were laid. I think that these could breed easily in aquarium if someone could get enough species to keep in a group. I kept mine three years without any problems after which I sold it to another catfish hobbyist. My experience is that it is a peaceful catfish that can be housed easily in a community aquarium. Very small tank mates under 5 cm could be in danger mind you. What I would say though is that one must be careful not to put it among too rough and aggressive company. Its only defence is to hide. At best you then won't see it in daytime and months can pass without seeing any sign of it. When I moved with my family I didn't see mine for a three months and I thought it had been eaten or just died. One afternoon when I was redecorating its aquarium it suddenly appeared out of nowhere and in very good and fat condition. It doesn't burrow in sand like Channallabes apus reportedly does. 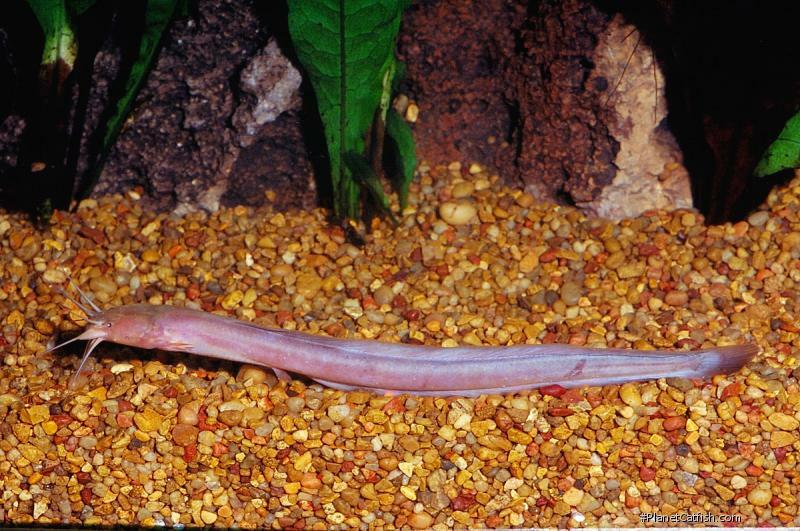 My eel-catfish preferred the underside of the roots, stones and inside of plastic tubes in aquarium as a hiding places. It is not a fast predator or an ambushing catfish, it searches food from bottom like most catfishes do. It accepts wide variety of foods: pellets, flakes, homemade foods, frozen and alive foods of course. Bloodworms seem to be very much in favour. I kept my eel-catfish with Mystus leucophasis, Anaspidoglanis macrostoma, Panaque L 191 and Synodontis schoutedeni without any problems. The only problems were when I introduced a new tankmate, Clarias pachynema, (An African species) to the aquarium. The Clarias did seem to dislike it and chased the Gymnallabes away upon sight. They lived together one year without any serious damage done. After that time Clarias decided to search for wider hunting grounds and jumped out of the tank. Gymnallabes typus is a species that I can suggest to everybody to try at least once. The only problem is rare imports from the region. If you see this catfish at your LFS don't wait; just buy it. It may be the only time in many years you will see these offered again. Type Locality West Africa, probably Old Calabar. Etymology Gymnallabes: From the Greek, gymnos, meaning hidden and allabes, the name of a Nilotic fish (a kind of lamprey); in reference to the shape and nature of the fish. The Latin specific epithet typus means model or example, in allusion to the fact that this distinctive species was the only one known when described. Identification Unpaired fins continuous, paired fins reduced or absent. Distinguished by the extremely elongate body, reduced cranial shield, confluent median fins, small eyes and presence of pelvic fins. Distribution West Africa: lower course and delta of the Niger River and Cross River basin in Nigeria. Also known from Cameroon. Other Parameters Sensitive to bad water.